Remember the Pepsi taste tests in the 90s? There was a cup of “cola” and a cup of Pepsi. Participants tasted both and then on camera revealed which one they liked the best (which was always Pepsi – imagine that). And there it was, irrefutable proof that Pepsi was the better tasting soft drink by two or three people. I recall some friends and family members sharing their surprise that Coca-Cola didn’t respond or accuse Pepsi of illegally using their trademark (which, for the record, they never did). But why would “Coke” do anything? Coke has pretty much won the cola war and has held onto the majority of the market share for decades. According to Beverage Digest, Coke controls 42% of the total carbonated soft drink market, compared with Pepsi’s 30%. However, when you’re looking to gain market share and your competition is going head-to-head with your products and services, it behooves you to take action, respond and retaliate. Consumers deserve to know why your brand is the better option. This is exactly the situation faced by T-Mobile. In 2014, the mobile communications company launched a petition, at Change.org/AbolishOverages, calling on other carriers to follow T-Mobile’s lead in dropping overages. The petition had approximately 250,000 signatures at the end of August and now has more than 330,000 signatures. And while T-Mobile CEO John Legere has been busy on social media promoting their brand and petition, the company felt it wasn’t enough. 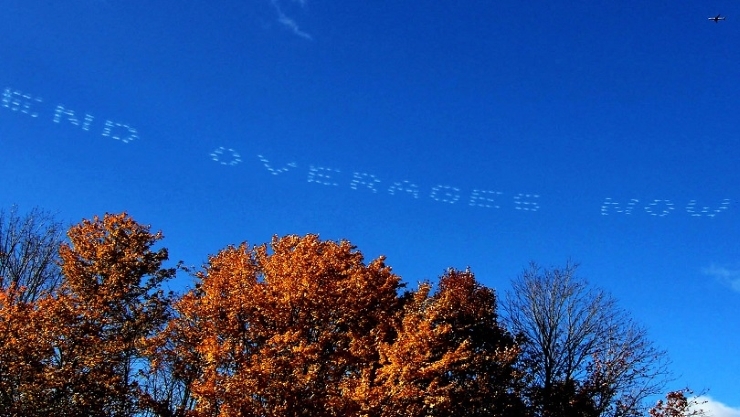 So they wrote their message where their biggest competitor’s couldn’t miss it… above their headquarters. The technique known as digital skywriting, utilizes five planes flying in formation and working in sync to write messages using a dot matrix system. Five aircraft in the sky over a specific location or community, demand attention and often causes local media and social media to buzz over the advertisement or campaign. What happened over the Verizon Wireless headquarters was no different. Check out this brief video to see it in action. While the battle rages on between mobile service providers, few will forget the lengths at which T-Mobile went to as they fought to rid the world of overages and earn more business. What do you think… would a digital skywriting message cause you to search for more information or share an image on your social media networks?